I found this great recipe for snow-type play dough. I thought it looked really neat so I made some. Now, here is the important part. I tend to be very play dough making challenged. I have yet to make a good batch of play dough. I follow the recipe exactly, but it never comes out right--it's always too sticky. I thought it was neat so I thought I would share the recipe with you, and maybe yours will come out right. 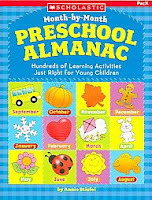 The recipe is "Month-by-Month Preschool Almanac," by Annie Stiefel. The recipe calls for melted snow, but you can also use tap water. Mix 1 1/3 cups of the snow water with the salt and bring to a boil (supervise children). Simmer several minutes, stirring constantly. Remove from heat. ( I wasn't sure exactly what was meant by several minutes, but I did mine for 5 minutes). Mix the remaining 1/2 cup of snow water with the cornstarch and add to the salt water. Stir well, then let cool. 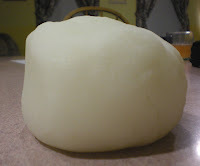 Store snow dough in an airtight container. For extra shine, have children work some silver glitter into the dough. Dough will harden within 36 hours. Much to my aide's chagrin, I brought the snow dough into class with me. I thought maybe it would get less sticky overnight--it felt better. So we let the children play--it was still sticky. I think it took the aide 15 minutes to get it all off the table, and little snow dough monsters kept appearing asking us to wash their hands. Thanks for finding this recipe. I needed to try something new with our daughter.